Do you batch cook (i.e. prepare large amounts of food) and freeze some of the bounty for later meals? 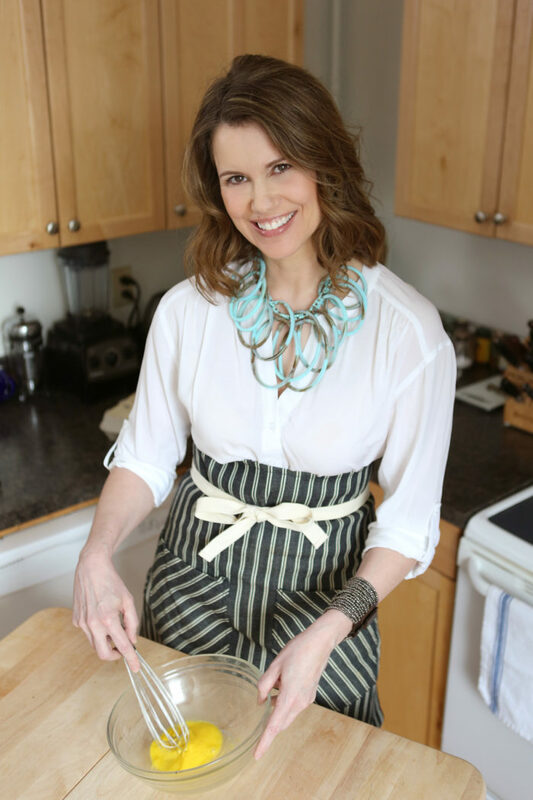 If not, I suggest giving it a try because it’s a great way to guarantee that you eat nutritious, home-cooked food (instead of take-out or ordering in) on tired, busy nights. I’ll be honest, my freezer used to be a place where food went to die. It was full of half-empty boxes of waffles, vegetables, and unlabeled brown things I’d long since forgotten were even in there. I keep a roll of masking tape and a sharpie handy for labeling containers with the contents + date. I started freezing leftovers like braised pork and beef in single-serve containers so I could pull one from the freezer for a quick meal. Freezing huge containers of food meant I never – ever – used it. 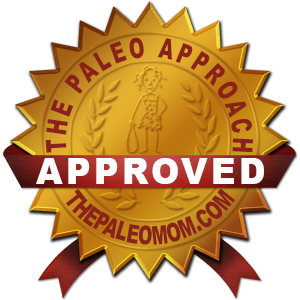 Ditto freezing bone broth (I freeze in pint jars), cooked rice (I portion out on a baking sheet in 1/2 cup portions, freeze, then transfer the frozen mounds to a freezer bag or larger glass container), soups/stews (I freeze in small glass containers), and meatloaf (I freeze in slices). 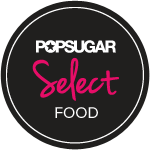 Just like the refrigerator, assign space in your freezer for similar types of food. Keep frozen vegetables and fruits together, frozen broths and soups together, and frozen meats together. If I have a lot of batch-cooked food in my fridge and I realize I’m going to be out for a few nights, I start freezing (and labeling!) things instead of letting food expire. 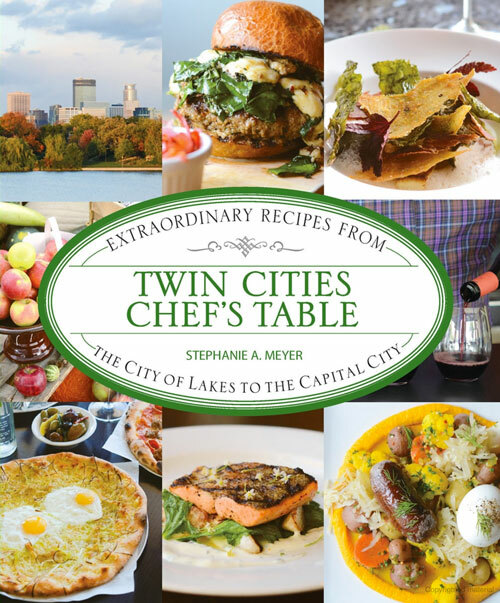 The foods I freeze most often: bacon/sausage, cheeses, braised meats, ground meat (meatballs, meatloaf), casseroles, baked goods, pestos, tomato sauce, quiches/frittatas, fruits, and broths/soups/stews. Invest in single-serve, stackable containers for the freezer (and refrigerator). I prefer glass containers (I avoid storing food in plastic whenever I can). If you plan to reheat food in a microwave, definitely invest in glass and avoid plastic (or transfer to a glass container for reheating). Avoid cracking glass containers by cooling food to at least room temperature before transferring to the freezer. 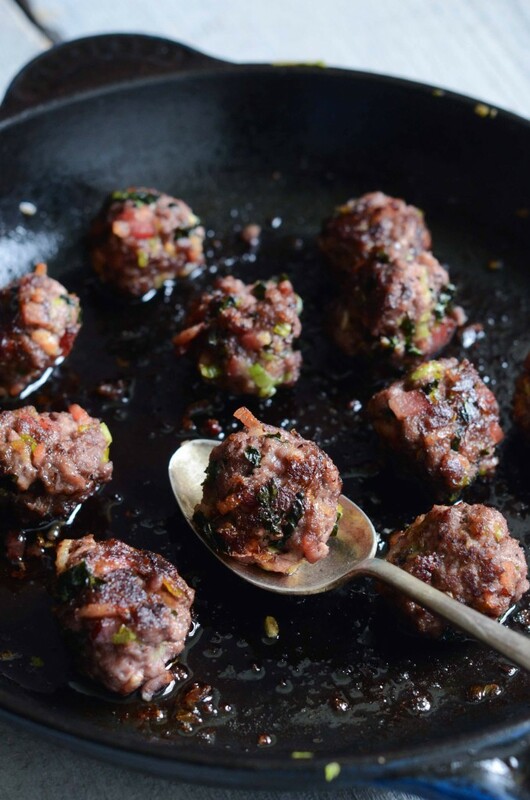 Make extra of foods that freeze well with an eye to the freezer – like these meatballs! Freeze bones leftover from roasts (chicken, beef, pork) in one large bag. Add bones to broth when making a batch. Meatballs are my top go-to for the freezer because they’re easy to store and grab a few at a time. 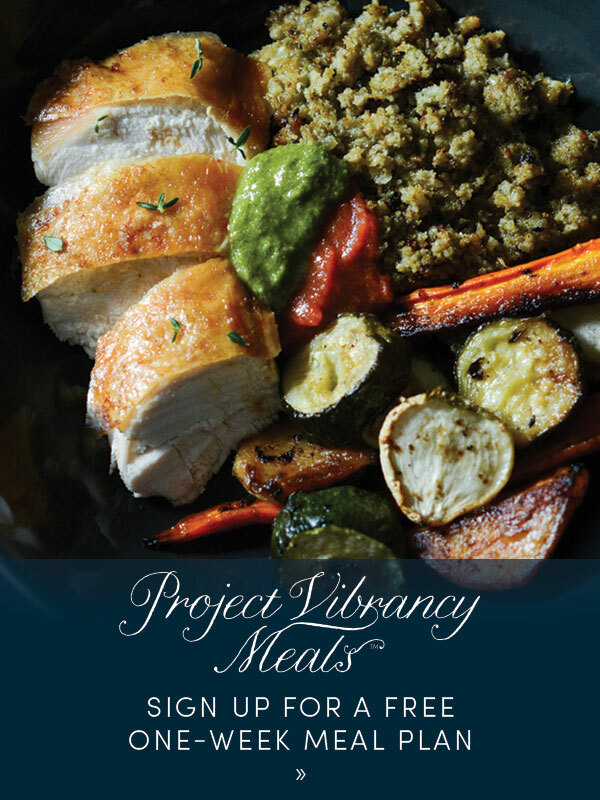 I am buried writing Project Vibrancy Meal Plans right now (coming soon!) and ironically, I find myself exhausted and starving at 8 pm with no food in the fridge (writing about food is hungry business, ha). Just a couple of days ago I reached into the freezer for some chicken bone broth and meatballs. 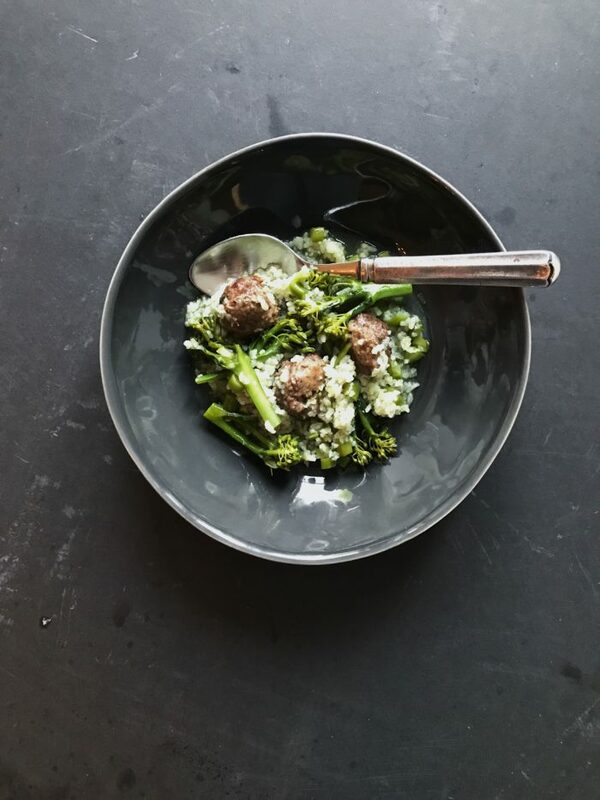 I cooked rice in the broth with collagen and trusty ginger scallion sauce and as it finished, I opened the pan and pushed frozen meatballs into the rice (oddly satisfying) and layered chopped broccolini on top. I put the lid back on and let the whole finish cooking. Into a bowl with more ginger scallion sauce et voila, a pretty damn fantastic and very nutritious dinner. 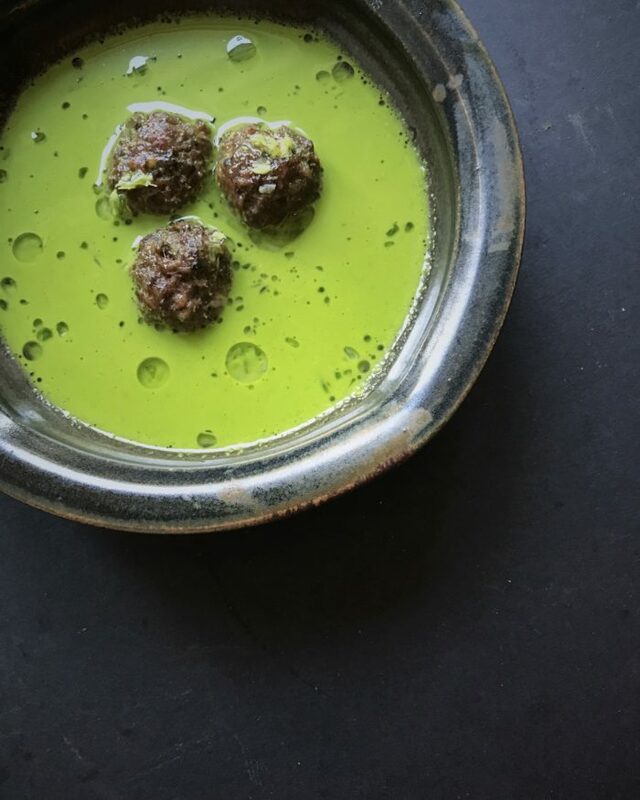 I’m also reminding you of this reader-favorite recipe because meatballs are a particularly delicious way to turn Healing Green Broth into a full-on meal. Add a drizzle of the above mentioned ginger scallion sauce and seriously, be so glad. 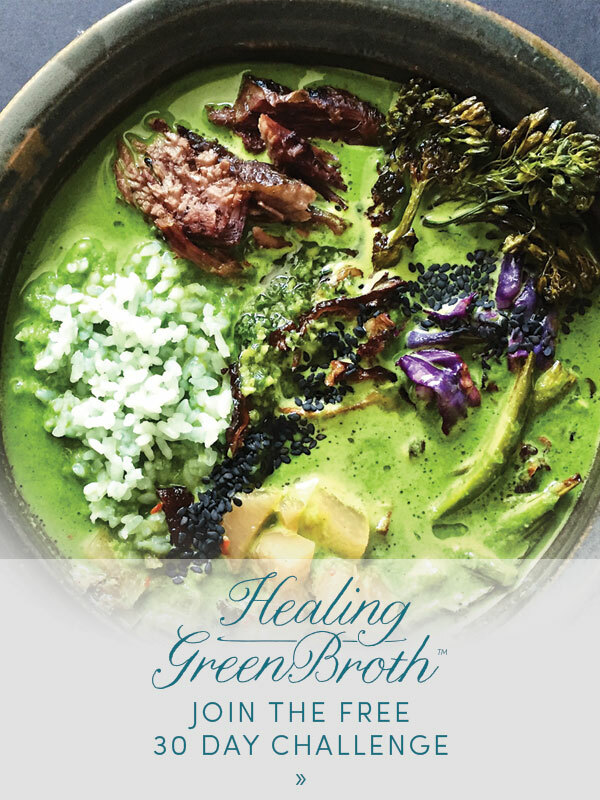 And while I’m mentioning Healing Green Broth, I am beyond thrilled to announce that I have a beautiful new website, thanks to my dear friend and designer Kim Kalina of Green Olive Design. She’s (the website, not Kim, ha) my new baby! 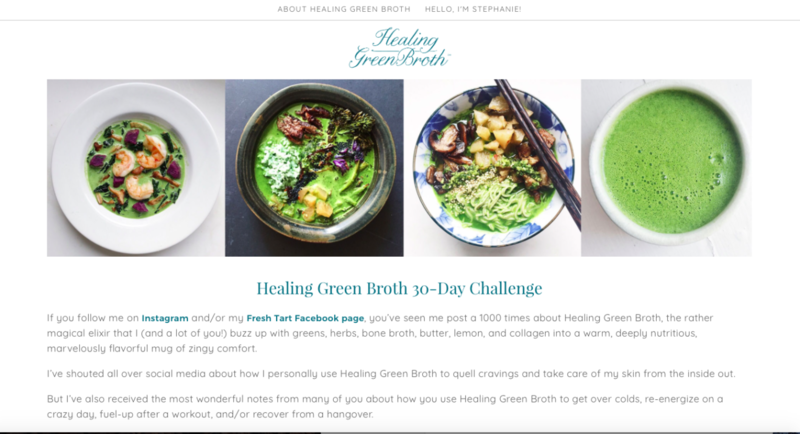 If you’re part-way through the Healing Green Broth 30-Day Challenge, you’ll notice a BIG upgrade in how the recipe/shopping list PDFs look. Like WOW. Take a peek and let me know what you think! 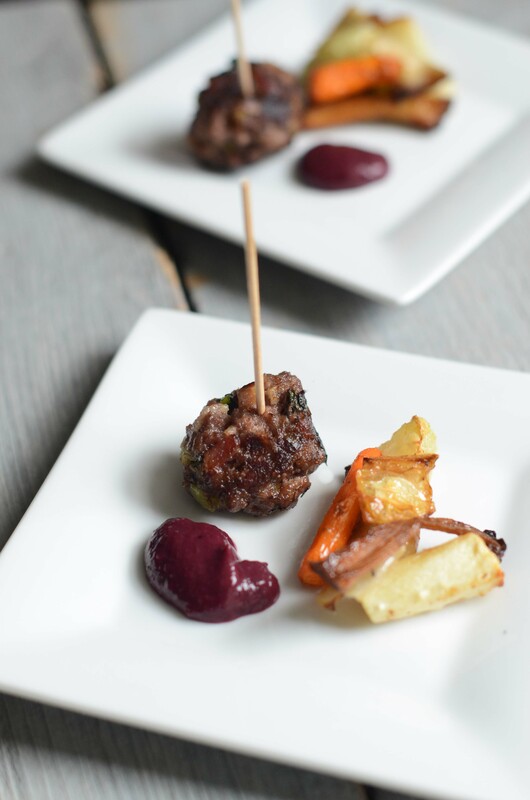 I’m a meatball fiend so I make these frequently, eating them as is, wrapped in lettuce leaves with good pickles, served as a party appetizer (with roasted vegetables and cherry-barbecue sauce, pictured below), and/or added to soups. (You know how I mentioned last week that I love crispy shrimp as a garnish for soup? Well, meatballs are a close second…I think you’ll like them too.) In addition to their undeniable deliciousness, meatballs can be made in big batches and frozen (reheat to your heart’s content for quick meals, snacks, and gatherings). Adding a bit of chopped bacon to grass-fed ground beef is a nice way to keep meatballs (and burgers) from drying out (a trick I stole from chef Scott Pampuch years ago) with the bonus of a hint of smokiness. The kale and leeks add moisture too, as well as color and flavor, while the gelatin and starch add tenderness and act as binders (in lieu of bread and egg). I tend to just fry the meatballs, especially on a warm day, but if you’re making big batches, baking meatballs in the oven is a neat trick with tasty results. I hope you had a festive July 4th! 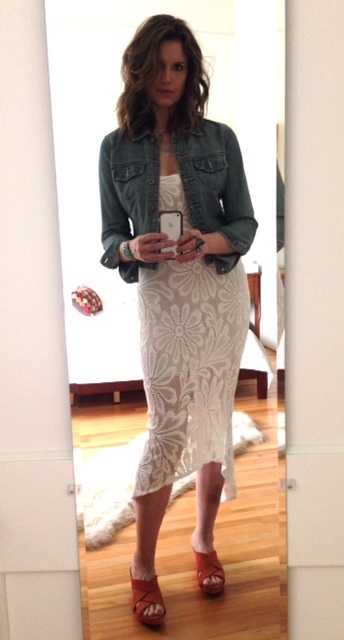 I spiffed up in red, white, and blue (in my fave white lace dress, which I can comfortably wear again thanks to the autoimmune protocol/AIP; last summer it was a no-go) and spent the day relaxing and celebrating with my lovely sister Stacey. We decided to see a movie (Begin Again, we really enjoyed it) followed by an amazing dinner (oysters, langoustines, shrimp, arctic char) at the Sea Change raw bar, ending with a short stroll out onto the patio to catch the fireworks over the Mississippi River. 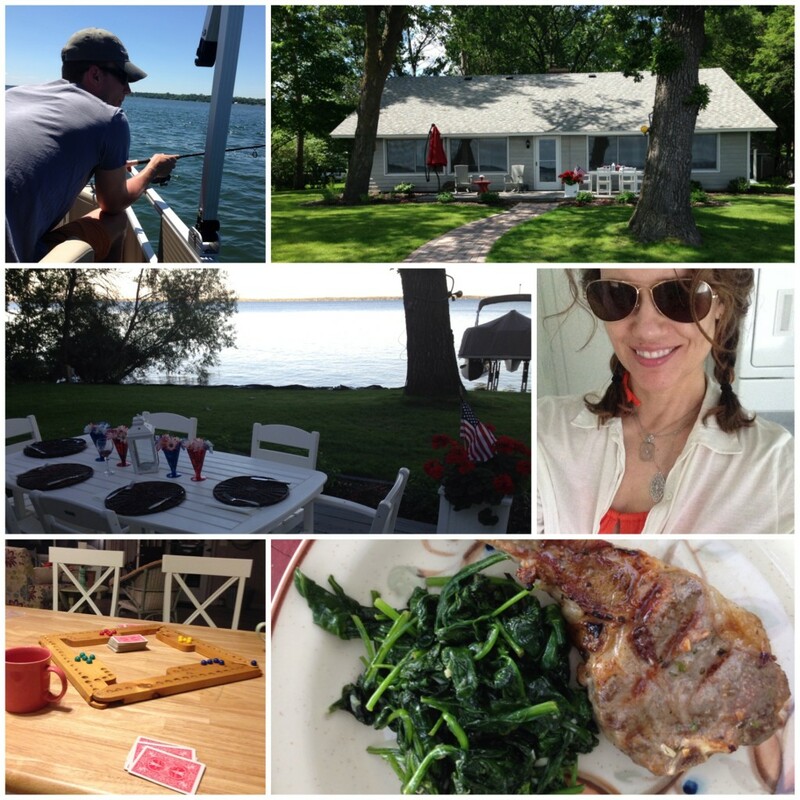 It was a perfect day, fun and delicious and stunningly beautiful. The next day I drove out to Green Lake to spend the rest of the weekend at my aunt Mary and uncle Bruce’s lovely cabin. 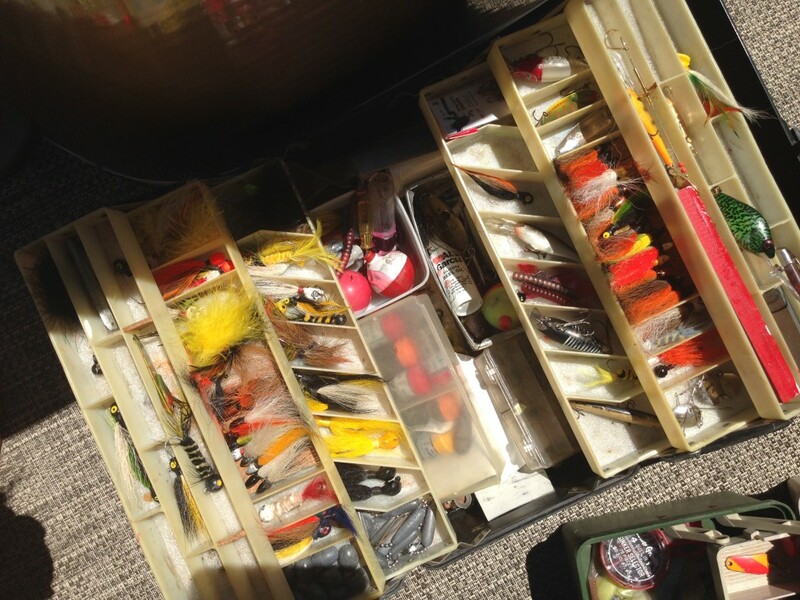 I tried my hand at kayaking (with my uncle, super fun) in the morning, then spent the rest of the day lolling in the sun out on the lake while my aunt and cousins Michael and Craig fished – that’s my Grandpa Meyer’s tackle box <sniff>. I slept like a rock and even still had to take a nap upon arriving home. That’s what vacation is for: good food, fun with family and friends, and lots of rest. I hope that you too found all three. In a large mixing bowl, combine ground beef, gelatin, arrowroot starch, 1 teaspoon salt, and several grind of black pepper. Using your hands, mix gently. Set aside. In a large skillet over medium heat, fry bacon until fat is rendered but bacon is not browned. Using a slotted spoon, transfer bacon to a paper-towel lined plate to cool (retaining pan drippings). Return skillet to the heat. Add kale and leek to the pan, sprinkle with a pinch of salt, and saute until almost tender, 10 minutes. Add garlic and saute for another 5 minutes. Using a slotted spoon, transfer vegetables to the ground beef (retain pan drippings; set pan aside). Add bacon to the ground beef and gently mix to combine. 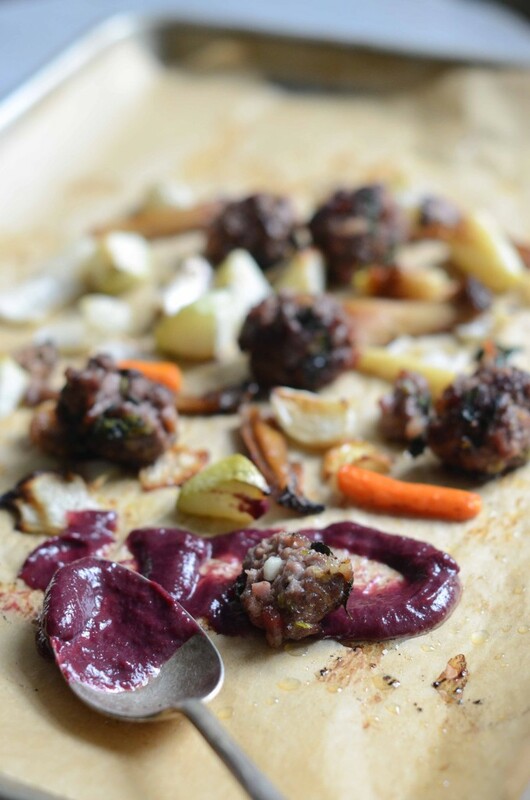 Roll mixture into 1-inch meatballs, setting on a baking sheet as you go. 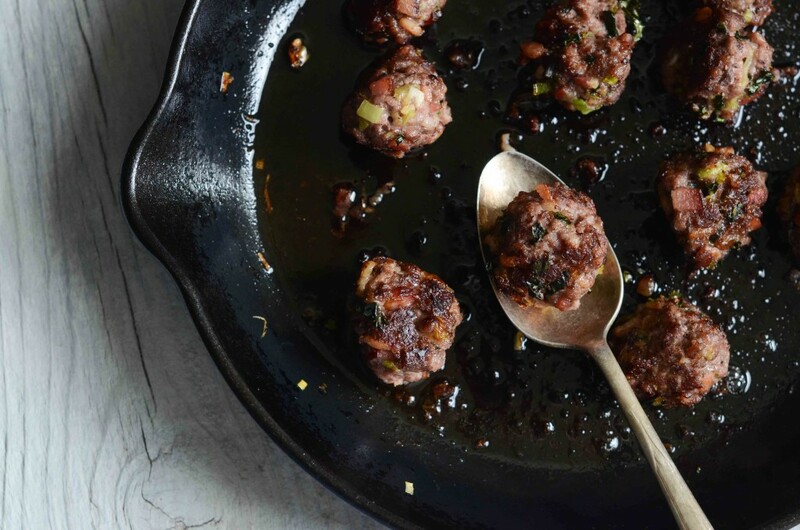 Return skillet to the heat and fry the meatballs in the pan until browned on all sides. Serve hot, or cool to room temperature and freeze in plastic bags.